Dallis Winsor, a former governor of the Alberta, Montana, Saskatchewan and N. Wyoming District (AMS&NW) has moved to Terrace, British Columbia and is working hard to bring optimism with him by starting up the brand new Kermodei Optimist Club of Terrace. In addition to prompting verbal support from the other Optimist Clubs in the PNW District, his effort brings up some questions that we will attempt to answer here. Where in the BC is Terrace? Terrace, BC is north, way north of the bastion of Optimist Clubs that populate the lower mainland. The city's website boasts that Terrace is the heart of the northwest. By air, it is 550 miles northwest of Vancouver, BC. According to Mapquest, it would take approximately 16 hours to drive the 850 miles from Vancouver, BC to Terrace, BC. PNW District Optimist Club members might find this reference helpful: Terrace is halfway between the sponsor club Hillsboro, OR and Fairbanks, AK. Yes, that is north by northwest. A Kermodei is a blonde or light-colored bear known by native tribes as a "spirit bear." 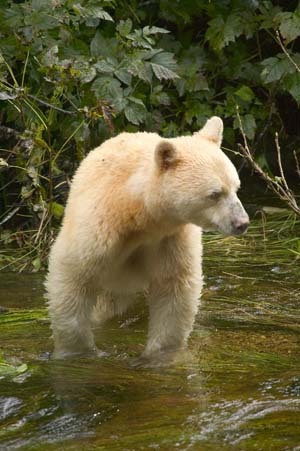 The taxonomy claims that the Kermodei may be an albino black bear, but Wikipedia better defines the color morph as due to a recessive allele common in the population of the subspecies of the American Black Bear living in the region. Cool! How can we help from a distance? Let's keep our thoughts positive for Dallis and the Kermodei Optimist Club of Terrace to reach the charter member number this week so they can start working on projects to bring out the best in children in Terrace. If you live in or near Terrace, don't wait; be an Optimist and join today. Reach out to Dallis at 250-635-5352.